The Chinese government called off a meeting between Premier Wen Jiabao and Japanese Prime Minister Kan Naoto at the last minute yesterday. The Chinese side held that the atmosphere for the talks had been ruined by certain statements by Japanese diplomats. A summit involving Japan and China was in jeopardy Friday after a Chinese foreign ministry official accused Japanese diplomats of making statements that violated China's sovereignty, according to the Chinese state-run news agency. China and Japan are participating in a summit of the Association of Southeast Asian Nations in Hanoi, Vietnam, but Japanese representatives made "untrue statements about the content of a meeting between Chinese and Japanese foreign ministers held earlier in the day," the Xinhua news agency said. Chinese Assistant Foreign Minister Hu Zhengyue said that "the Japanese move ruined the atmosphere for leaders from the two sides to conduct talks in the Vietnamese capital." Japanese media are framing the dispute a different way, saying that Hu told Hong Kong media that Foreign Minister Maehara Seiji was directly responsible destroying the mood that could have led to a summit meeting. "Creating (noise)" is not quite the word that the Japanese press is reporting. The Chinese phrase is translated as mushikaesu -- "to reheat" -- an issue. QUESTION: (Via interpreter) (Inaudible) Deguchi with Kyodo News Service. First a question for Secretary Clinton, and this is about security. Recently – this is about Senkaku Islands, which has (inaudible) spat between Japan and China. And I wonder if the security treaty between Japan and the United States will be applied. FOREIGN MINISTER MAEHARA: (Via interpreter) There was a question about the Senkaku Islands and rare earth minerals. As I have been saying, Senkaku Islands, in terms of history and international law, are inherent territory of Japan and have – we have had (inaudible) control over the islands and will continue to do so. Today, Secretary Clinton repeated that the Senkaku Islands would fall within the scope of the application of Article 5 of the bilateral security treaty. That was very encouraging. All these quotes are from the press availability Maehara and U.S. Secretary of State Hillary Clinton had on October 27 in Honolulu. No shading of meaning, no "nothing has been fully resolved" as regards sovereignty. Just a clear and blunt statement to the Chinese that for the United States at least the Senkakus are Japanese territory -- no, ifs, ands or buts about it. It is perhaps not fair that Maehara is blamed for destroying the mood in advance of the summit. After all, he was not the one who asked the question and he had no control over how Secretary Clinton chose to present the U.S. position. With regard to the rare earth minerals, as Secretary Clinton stated earlier, even if this problem did not exist, to rely for 97 percent of the – these resources on China, as we look back, was certainly not appropriate and therefore we have to diversify the sources of rare earth minerals. And here again, Japan and the United States will closely cooperate with each other in order to engage in more diversified rare earth minerals diplomacy. While cheering on Japan-U.S. cooperation probably won Maehara kudos in Washington, it could have only made the Chinese steaming (the mushi of mushikaesu means "to steam") mad at the foreign minister. In something of a surprise announcement, Democratic Party of Japan Secretary-General Katsuya Okada revealed on Tuesday that the party was repealing its self-imposed ban on receiving political donations from corporations and organized groups. The Democratic Party of Japan will resume accepting corporate donations in the face of financial difficulties, a senior lawmaker of the ruling party said Tuesday. DPJ Secretary General Katsuya Okada said the party has to partially relax its policy of voluntarily refraining from receiving contributions from businesses amid increasing complaints from its parliamentarians that a lack of funds is hampering their political activities. It can be argued that the total effects of Okada's announcement are minimal. The DPJ's self-imposed ban was a legacy of a decision made in January by the Secretary-General Ozawa Ichiro in what was clearly a public relations stunt trying to draw attention away from his and then Prime Minister Hatoyama Yukio's stunning political funding scandal problems. Revoking the total ban was merely reversing a decision that had been made out of political desperation and cynicism. Furthermore, the DPJ is staying true to its promise in its Manifesto to not accept political donation from companies with with public works contracts with the central government totaling more than 100 million yen. This was the same ban it proposed as a bill when it was in the opposition in 2009. Had that had bill passed, it would be a rule covering all parties, rather than a unilateral and still continuing commitment by the DPJ. Furthermore, the DPJ has a darn good reason to ask for corporate and organizational donations: it needs the money. Cash from individual contributors has been so far insufficient to move the DPJ away from its longtime dependency on public funding of political parties. The party currently receives 80% of its funding for its political activities from the public elections support fund. By contrast, its main rival, the Liberal Democratic Party, which has no similar restraints on the types of cash it is willing to imbibe, relies on the public elections support for only half of its funding. One (decidedly minor) explanation for the severity of the DPJ's defeat in this summer's House of Councillors election was that its local chapters were simply outspent by their LDP rivals. This explanation, if valid, looms large over next year's unified local elections, where the DPJ would like to hold its ground, if not indeed win a few prizes from out of the hands of the LDP. If the party does not have the funds, however, it will not have the wherewithal either to make much headway against the LDP's incumbents nor defend its performance as a party. The DPJ is, after all, the party in power on the national level: it cannot run on the low-cost message of "Change" that it could rely on during the years it was in opposition on the national scene. On the local level it will have to compete nose-to-nose, candidate versus candidate against a still vital local LDP base, with the LDP having the ability to raise funds from anywhere. In politics, however, much depends on timing -- and Okada's timing of his announcement was lousy. Only three days earlier the DPJ lost its seat it had held in the Hokkaido District #5, where the DPJ incumbent had been forced to resign her due to illegal campaign contributions by the Hokkaido Teacher's Union At the same time the Diet is aswirl with rumors on whether or not the DPJ will buckle under to opposition pressure to have Ozawa Ichiro be summoned to give testimony in the Diet or be forced to put in an appearance before the Diet's Ethics Committee, with Ozawa's coming indictment looming over the proceedings. Announcing a reversal a self-imposed ban on accepting certain types of political donations at this precise moment was, at best, untimely. What garbles the message further is that despite the announcement of the reversal of the total ban for now, the DPJ remains committed to another of its Manifesto promises that will reimpose the ban universally through legislation, effective in three years' time. The response to the Okada announcement was predictably negative. The Tokyo Shimbun carried a front page analysis denouncing the reversal as "a betrayal of the public trust." LDP Secretary-General Ishihara Nobuteru said that reversing its position on corporate and organization donations at time when "money and politics" has been a major topic shows the DPJ is bent on creating "a complete and total mess." Your Party leader Watanabe Yoshimi simply dismissed the DPJ, with a "Here we go again, saying something and not following through on it. When what you say and what you do diverge, that just accelerates mistrust in politics." Even among his fellow Democrats, Okada's announcement was derided. "At a time when 'money and politics' are so much in the news, this is hardly a plus," intoned Chief Cabinet Secretary Sengoku Yoshito. Business, which would be expected to pony up some cash to help underwrite the DPJ's chances in the unified local elections, is understandably ticked off by the DPJ's seeming triple standard, and thus unlikely to return Okada's sudden expressions of affection. Rejecting corporate donations, then saying the party will accept them, only to make them illegal for everyone at a later time is hardly the way to show businesses that the DPJ really holds their interests and opinions to be of lasting value. What is most unfortunate about Okada's announcement is that it only further whittles away the DPJ's identity. One of the founding myths of the DPJ, one it has cultivated and clung to over the years, is that it is the "clean politics" party -- as opposed to the LDP, the party which found the mix of corporate cash, budgetary pork and fairly blatant vote buying downright cozy. Even after the arrests of Ozawa Ichiro's aides on accounting violations involving the Rikuzankai political fundraising group, opinion polls still showed the public believing that the DPJ represented clean politics. This latest announcement makes a complete muddle of that message, one that gave the people so much hope in August 2009, when they finally and decisively turfed the LDP out in favor of the DPJ. The bungled Okada announcement may just be a tempest in a teapot--but the DPJ and Okada in particular simply have to start looking a little sharper...and I do not mean Ren Ho in Vogue Nippon sharp. One of the long-running dramas since the changeover from Liberal Democratic Party to Democratic Party of Japan government has been who shall be in charge of the government policy making. Having allowed the weekly meeting of the Administrative Vice Ministers to disestablish itself and having abolished the Prime Minister’s Commission on Economic and Industrial Policy (Keizai Zaisei Shimon Kaigi), the DPJ-led government has had a heck of time working out a replacement set of institutions. The 2009 election manifesto promised that the party would establish a National Strategy Bureau in charge of collating, evaluating, revising and then promulgating coherent national policies for the ministries to carry out. However, after more than a year in power, when the position of Director of the National Strategy office has passed through the hands of such powerful politicians as Kan Naoto and Sengoku Yoshito, the DPJ still had no functioning national strategy center. The National Strategy Unit became the orphan division of the government, overshadowed by its more telegenic rival innovation, the Government Revitalization Unit, whose televised hearings of bureaucrats being dragged over the coals by politicians and civilian appointees were one of the DPJ government's rare total triumphs. In July, it was even thought that the National Strategy office would be relegated to a talk shop, its sole responsibility being the offering of advice to the prime minister. The fate of a government institution would hardly seem worth getting excited about, what with all the other political theatrics going on (the Hatoyama-Ozawa "money and politics" show, the debacle over the Futenma-to-Henoko move, the Hatoyama resignation and the rise of Kan, the DPJ mauling in the July House of Councillors election, the Kan-Ozawa leadership race). However, the question of just who would be in charge of policy making in Japan was a serious problem. The abolition of the DPJ's policy research council and the aimless course of the national strategy office contributed to the development of one of the most corrosive internal disputes of the party: the fight over the seeming concentration of seemingly all policy making power in the hands of Party Secretary- General Ozawa Ichiro. While Ozawa's grasp on policy making was not necessarily complete, the lack of a clear rival policy making organization or an explanation of how policies were being initiated left many in the party feeling like powerless outsiders. A winter rebellion of the concentration of power in Ozawa's grasp led to a showdown over the dismissal of Ubukata Yukio, a fight Ozawa atypically lost, as Ubukata was reinstated as a party deputy secretary-general before his dismissal became official. The fall of Ozawa in tandem with the resignation of Prime Minister Hatoyama Yukio led to a lessening of the angst over policy making but did little to relieve the problem of who was in charge. The previously abolished DPJ policy research council was reestablished and attention paid to the lack of a formal strategy apparatus. However, the relationship between the party's policy research council and the national strategy office was not clarified. Not long after, the DPJ suffered a stunning setback in the House of Councillors election, eliminating the chance that the national strategy office could be raised to the status of a Bureau of the government, empowered to develop policy for all the ministries and agencies of the government. It was in the period after the election that policy decision making truly became institutionally opaque. The DPJ policy research council existed, the National Strategy Unit existed -- but neither seemed to have a clear function. Instead all policy decision seemed to be arising out of the offices of the two most powerful personalities in government: Chief Cabinet Secretary Sengoku Yoshito and DPJ Secretary-General Edano Yukio. Policy seemed to be whatever the last utterance of either man had been. That the new National Strategy minister was immediately embroiled in a tempest-in-a-teacup political finance scandal seemed only to further diminish the office. The situation improved somewhat after the Cabinet shakeup in mid-September. Newly-installed Secretary-General Okada Katsuya had his hands full with party affairs, leaving policy making to newly-appointed National Strategy minister Gemba Koichiro, who at least had the double institutional punch of being simultaneously minister for national strategy and chairman of the DPJ policy research council. Sengoku, as the incumbent chief cabinet secretary, stood taller than his rivals -- and his grasp on the tiller of policy in no way shaken by the appointment of Gemba. The absence of a formal structure was all too obvious. When in the afterglow of his victory in the party leadership election Prime Minister Kan announced that in his regime everyone's opinion would be respected, that there would be "a cabinet of 409" - the number of DPJ Diet legislators -- he expressing a nonsensical idea that nevertheless perilously reflected the prevailing institutional reality: that there was no one formally in charge of policy and that every opinion was equal -- with Sengoku Yoshito's opinion being more equal than others. This week, however, National Strategy Minister Gemba announced a reorganization of the government's policy making system that seems to answer many of the questions of who exactly is supposed to be in charge of what in government. Under the new plan, two officials remain responsible for policy making: the Chief Cabinet Secretary and the National Strategy Minister. Beneath the national strategy minister, the National Strategy Unit will be split into two divisions: one dedicated to the coordination and implementation of already promulgated government pledges and another dedicated to serve as a sort of think tank for the prime minister, focused on out-of-the-box thinking on national issues, particularly foreign policy and security issues. The individual with direct responsibility for the management of these issues will be Cabinet Office Deputy Minister Hirano Tatsuo. As for the prime minister's think tank, it will be headed by Cabinet Office Parliamentary Secretary Akutsu Yukihiko, holder of an M.A. from George Washington University who is considered Prime Minister Kan's close confidants and by Special Advisor to the Prime Minister Kato Koichi, an electrical engineer who used to work for Recruit. The division of labor was done on the simplest of bases. Sengoku and his team of 100 have kept under their control the hardest issues the government is currently facing. The fuzzier, more ambitious and vague plans seem to have been handed off to Gemba and his people, who number no more than 30. That the policies were divided into categories of hard/immediate versus soft/long term, and divvied out to the Chief Cabinet Secretary and the Minister of National Strategy Minister accordingly underlines that for all its formality, this is still an ad hoc arrangement. These issues are the problems now but what happens later? Can a issue transition from one side to the other? Based on what criteria will the transition take place? When a new issue arises, who gets it, and again, based on what criteria? The division also makes clear that though Gemba may be the nominal minister of national strategy, the primus inter pares of national policy remains Chief Cabinet Secretary Sengoku. The extent to which he looms over policy is the stuff of tabloid dreams, where he is frequently posited to be the actual prime minister of the country. The Gemba proposal formalizes this dominance in the hard stuff, while establishing a set of second-tier issues not worthy of Sengoku's direct management. So while Gemba's proposal offers greater clarity as to who is in charge of what right now -- which was a serious question, so it is good that he is proposing a solution -- it is still clearly only a temporary solution. The meandering tale of the promulgation of Japan's national strategy under the DPJ meanders on -- with a little more clarity, to be sure. Tani Ryoko announced her resignation from competitive judo on Friday, leaving behind a sport that had made her wealthy, famous and one of Japan's most beloved athletes. She is without a doubt made her country's most successful international competitor, with a career record of two Olympic gold medals, two silvers and a bronze and 7 world championships. As she said her goodby to judo, at least as a professional athlete, television networks showed just her face. They did not pull back to show who was sitting next to her as she announced her retirement. It was left to the morning papers to reveal that as she gave her farewell, to her right sat a grim Ozawa Ichiro. "What was he doing there?" Ozawa ostensibly had a reason to be present at the resignation ceremony. It was he who had personally wooed Tani, convincing her to become an at-large party candidate for the Democratic Party of Japan for the election. It was he who pushed her to the forefront of the July 2010 House of Councillors election campaign, making her one of the party's main "faces." It was for his party leadership campaign that she had worked so tirelessly, traveling seemingly everywhere with him -- all of which kept her from the dojo, where she needed the practice time. It was because of and for him that she simply was no longer capable of putting in the hours necessary to be a world-class athlete -- not to mention the mother of two very young children. Nevertheless, Ozawa's presence, seated directly beside Tani on dais, still resonates oddly. Tani Ryokyo is an adult. When she accepted the invitation to run for the office, she had the responsibility to herself and to the nation to have know that she was making a major commitment -- one that would involve sacrificing something. That she did not have a clue about this reality was evident -- her comments that she intended to represent Japan at the 2012 Games in London earned her a flood of scorn from the members of the opposition Liberal Democratic Party. 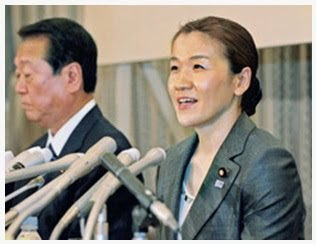 Ozawa's presence at her farewell press conference made it seem in some senses that he was taking responsibility for her having to leave the world of judo behind, when the decision and the responsibility should have been hers. The picture jars in another way as well. When Ozawa ran for the leadership of the DPJ against Kan Naoto, he promised that if he lost he would fade away and become a common foot soldier for the party. At a reception after his defeat, he told a crowd of his supporters that "Mr. Kan told me I should be quiet, but I went ahead and made a lot of noise. Now I am going to be quiet." In the interim, the Tokyo No. 5 Committee for the Inquest of the Prosecution decided that Ozawa should be indicted for crimes linked to accounting irregularities at his Rikuzankai political funding organization. Given these promises it was hardly wise, for his political future and for Tani's, for him to show up at a press conference, sit on the dais, then push reporters away wanting to ask him questions about his current predicament -- especially on the very day his lawyers had filed a lawsuit suit against the prosecution for exceeding its mandate. His hasty exit from the press conference after some brief laudatory comments for Tani, insisting he had to go as "he had his public duties to attend to" (komu no tame), was just more fodder for an unfriendly press corps. Whatever his intentions, the appearance of Ozawa at Tani's side was not going to be portrayed as an expression of remorse for having robbed Japan of its greatest international sportswoman. Instead, it would be read as though he was asserting that he had taken over Tani's life. His looming presence reinforced an impression -- one that the press loves to foster -- that Tani is not so much a member of the DPJ as a member of the Ozawa Group and that he was there because she was his. Not exactly the attitude or image of a common foot soldier, this. Of course, no one expected Ozawa to fade into the background, becoming a simple member of the Diet of no special standing, even though he holds no official title (he flatly rejected the title of Senior Advisor to the party when it was offered to him). He continues to enjoy the loyalty and support of members like Tani whom he enticed into dropping their careers in favor becoming Diet legislators. Nevertheless, the press presents the image that he owes it to the party -- particularly the members of the government who have been tying themselves in knots trying to defend his not resigning or being expelled from the DPJ, not appearing to give testimony sworn or unsworn about himself in the Diet, not even appearing before the toothless Diet Ethics Committee -- to stay in complete seclusion (actually, they believe he owes it to the nation to resign from the Diet). His popping out of the background to appear at one of the most important sports announcements imaginable just feeds the appetite of the newspapers. That he did not restrain himself from appearing at the press conference is due also to the fact he has some 150 members in his Group -- 150 Tanis, if you will -- at his disposal. His loss in the leadership race and his imminent indictment have shaken the loyalty of some of the members of his group. However, most are likely still loyal to the man -- though not perhaps as visibly and as seemingly deeply as Tani is. Ozawa still can use the possibility he might leave the party together with his followers -- or the threat he might join forces with the Hatoyama Group to form a huge anti-mainstream bloc in the party -- to prevent the party leadership from dealing with him as they would any other common party foot soldier with huge political funding problems. So though he has sworn he would become unobtrusive, Ozawa remains in the picture. As regards the Chinese protests on Saturday, the Chinese national government has phoned in with its own protest. BEIJING, Oct. 17 - The Chinese government called on the public to express patriotism rationally and in line with the law Sunday in the wake of sometimes violent protests against Japan the previous day over a territorial dispute. You have to admit, when a government supposedly as tyrannical and ruthless as China's is reduced to imploring members of the public to act rationally and obey the laws of the land, you are entirely in your right mind to be concerned about the power of said government to maintain control over anti-Japanese thought and action. What is it that the proverb says is so difficult about riding the tiger? By trying to outdo its netizen patriots in ramping up the territorial hysteria last month, the Chinese government may be finding out. Though the outcome was not necessarily inevitable, it is unsurprising. In what looks like nice weather, a whole lot of Chinese gathered together in groups today to protest Japan's effective control of the Senkaku Islands. The demonstrators shouted anti-Japanese slogans and called for boycotts of Japanese goods. An Ito-Yokado store in Chengdu lost its front windows. So much for a winding down of tensions after the Kan-Wen meeting on the sidelines of the ASEM meeting in Brussels. To be fair, Japan's right wingers got in their licks in first, with a demonstration two weeks ago in Shibuya decrying the Japanese government's lack of spine in releasing with the Chinese fishing boat captain accused of ramming two Japanese Coast Guard vessels. They had a repeat performance near the Chinese Embassy in Tokyo today. However, today's spontaneous and window-smashing demonstrations in Chengdu, Hangzhou and other cities -- as well covered by the national media as the Shibuya demonstrations of two weeks ago and today's were ignored -- will feed into the growing Japanese populist narrative that the Chinese have lost all sense of proportion, that they have become drunk with power and self-righteousness. However, before anyone mouthes off about the special character of anti-Japanese feeling in China and its official sanction as special root causes of the demonstrations and the outbreak of violence, there should be an admission that the formation of instant mobs seeking redress for some wrong is a chronic feature of modern China. There are demonstrations of this kind, many descending into violence, on matters regarding land control, food safety, political corruption and the like. Mob activity is therefore not necessarily indicative of a particularly strong anti-Japanese feeling. Mob actions in China should also be seen as the physical expressions of what were out-oud wishes or off-the-cuff remarks of Communist Party leaders. In attacking Japanese possessions inside China, members of the public are reconfirming locally the threats that leaders such as Premier Wen Jiabao made on the national level. It may not sound like much a of summit meeting -- a 25 minute impromptu meeting in the hallway outside the main dining room at the ASEM Summit -- but the face-to-face meeting between Prime Minister Kan Naoto and Chinese Premier Wen Jiabao represents a significant diplomatic victory for the Japanese side. I tend to agree with Peter Ennis of Dispatch Japan that the Japanese government succeeded in getting pretty much all it could hope for out of the confrontation with China over the arrest of the Chinese fishing boat captain near the Senkaku Islands. - Make the Chinese government look like an out-of-control freight train? Check. - Call into question who is running the show in Beijing? Check. - Nudge the United States into stating unequivocally that the defense of the Senkaku Islands would be covered by the Japan-U.S. Security Arrangements? Check. - Have the captain freed by a minor functionary, making it possible for the Japan's political leaders to claim (implausibly, it is true) that they had nothing to do with the decision? Check. - Have the minor functionary read off a list of completely nonsensical reasons for taking the action he was taking, making it absolutely clear that he was reading something someone higher up (Where? Who knows?) wrote up for him to read? Check. However, the Japanese government did lose out on one extremely important request that it made early on -- that there be immediate high level talks between leaders in Tokyo and Beijing in order to defuse the situation. That request, made by Chief Cabinet Secretary Sengoku Yoshito, was utterly ignored by the Chinese side. Amongst all the ratcheting up of tensions, mostly on the Chinese side of the ledger, the failure to have its appeal for high level talks honored was the one turning point in the drama where the Japanese side could truly be said to have lost face. Hence the importance of today's meeting in the hallway between Kan and Wen. The Japanese side went to Brussels without anything in the bag -- only a vague sense of China's intention to improve relations. Securing a high-level bilateral meeting, even under the most restrained of circumstances, plugs a huge hole in Japan's credibility after its valiant climbdown from its dangerously out-of-control confrontation with China last month. Whether the domestic media, particularly the weekly magazines, which have gone berserk over Japan's supposed humiliation by China, give the government a thimblefull of credit for at last receiving what it had asked for at the very beginning of the crisis, is, of course, highly doubtful. As this is being typed, the representatives of the Tokyo No. 5 Committee for the Inquest of the Prosecution are tacking up the indictment the committee has handed down against Ozawa Ichiro in the case involving misleading entries in the 2004 and 2005 reports of his fundraising group the Rikuzankai. Here group dynamics, legal behavior and facts meet in conflict. Prosecutors have twice declined to indict Ozawa, certain that they could not make the direct connection between the entries in the books made by his subordinates and any direct order from Ozawa himself. Having once overruled the Prosecutors Office's judgment, the committee has decided to stick with its earlier request to indict, this even though the committee has new members without a personal stake in the original decision. Has Ozawa's career in politics been fried on a fluke decision of a group of randomly picked citizens? For now, it seems that answer to that question is yes. He will certainly have to fade from the foreground as he prepares for his trial, at which he is almost certain to be found not guilty. As for the DPJ, it will suffer minimal damage from this turn of events. The Cabinet is entirely free of Ozawa Group members and even the lesser political positions have only a sprinkling of his followers in them. Without their leader in full, unencumbered command, Ozawa's people are going to have to hew more steadily to the main party line of moderation and caution in matters political and fiscal. Still, the stain of indictment will be fodder for those in the opposition who wish to avoid real issues and continue bashing the DPJ on "money and politics" issues. Look for grandstanding today, tomorrow and through the week on an issue where in any sane world, the main opposition Liberal Democratic Party should keep its mouth shut.